From the "caught my eye department:"
Two "Spinal Tap"-like flower power/psychedlic moments. Bon Scott, the deceased former singer of AC/DC (Highway to Hell), singing for a band called Fraternity. Here is Bon dressed as a schoolgirl with AC/DC singing (Baby) Please Don't Go. The Scorpions from 1972 playing "I'm Going Mad." Update: here is some Bon Scott pop stuff. Ugh. File that under "Skeleton" in the closet. Here's something that's much better from Mr. Scott. I have been a DirecTV customer for some time now and have had few problems with my service. When I visit the PowerGrandma, a cable subscriber, I often see television ads that suggest that DSS customers often lose their satellite signal on cloudy days. That's true, but I only lose my signal when animals are beginning to pair up and move towards the big boat parked out back in the ravine (i.e. when the clouds are very thick with rain or snow). As a spontaneous test, I threw 5 hand towels (unfolded) over our satellite dish. The first towel had no effect on the reception on our telly. Neither did the second, third, fourth, or fifth. I never lost the reception. 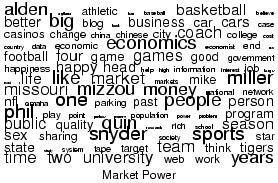 Link to Word Cloud generator from Snapshirts (use custom button) found at The New Economist blog. Update: Here is Martin Andrade's word cloud. Surfing the Web last fall, a Chinese high-school student who calls himself Zivn noticed something missing. It was Wikipedia, an online encyclopedia that accepts contributions or edits from users, and that he himself had contributed to. The Chinese government, in October, had added Wikipedia to a list of Web sites and phrases it blocks from Internet users. For Zivn, trying to surf this and many other Web sites, including the BBC's Chinese-language news service, brought just an error message. But the 17-year-old had loved the way those sites helped him put China's official pronouncements in perspective. "There were so many lies among the facts, and I could not find where the truth is," he writes in an instant-message interview. Then some friends told him where to find Freegate, a software program that thwarts the Chinese government's vast system to limit what its citizens see. Freegate -- by connecting computers inside of China to servers in the U.S. -- enables Zivn and others to keep reading and writing to Wikipedia and countless other Web sites. That's from this Wall Street Journal article ($$$) published on Feb 13th, 2006 on so-called "Hacktivisits." Roughly a dozen Chinese government agencies employ thousands of Web censors, Internet cafe police and computers that constantly screen traffic for forbidden content and sources -- a barrier often called the Great Firewall of China. Type, say, "media censorship by China" into emails, chats or Web logs, and the messages never arrive. Even with this extensive censorship, Chinese are getting vast amounts of information electronically that they never would have found a decade ago. The growth of the Internet in China -- to an estimated 111 million users -- was one reason the authorities, after a week's silence, ultimately had to acknowledge a disastrous toxic spill in a river late last year. But the government recently has redoubled its efforts to narrow the Net's reach on sensitive matters. ...It has required all bloggers, or writers of Web logs, to register. At the end of last year 15 Internet writers were in jail in China, according to the Committee to Protect Journalists, a New York group. China also has gotten some U.S. Internet companies to limit the search results they provide or the discussions they host on their Chinese services. A tiny firm Mr. Xia set up to provide and maintain Freegate had to lobby computer-security companies such as Symantec Corp., of Cupertino, Calif., not to treat it as a virus. In response to China's crackdown, and to restrictions in many Middle Eastern countries as well, a small army has been mustered to defeat them. "Hacktivists," they call themselves. It is already happening. As technology improves, it will become harder and harder to suppress political freedom. Can China stop political freedom now that they've opened up to economic freedom? Can they even hope to contain it? Last year sometime, the Powerwife and I lost many digital photos we had stored on our home computer, including our pictures of one of the Powerkid's third birthday party. Luckily, we were new to digital photography at the time so we didn't lose too many pictures. "Many of the cheap burnable CDs available at discount stores have a life span of around two years," Gerecke says. "Some of the better-quality discs offer a longer life span, of a maximum of five years." From what I've read, personally-recorded DVD's last for decades, so I am probably safe if I decided to put some of our home movies on DVD. Then I'll be able to bore the neighbors for years! How Far Have Computers Come? 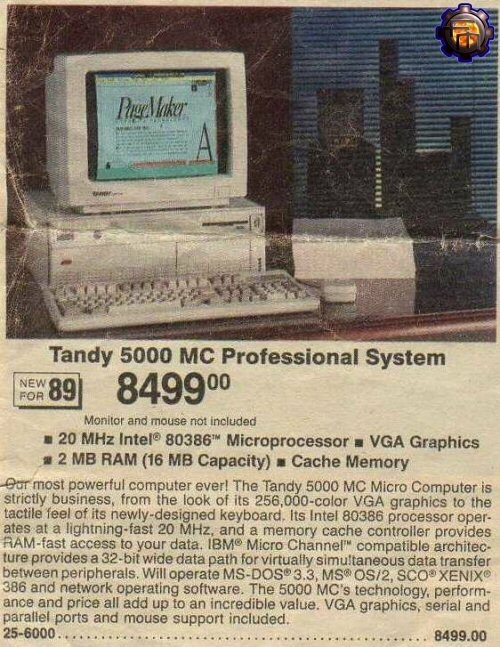 It's a Tandy! It costs only $8,499! It's got 2 MB of RAM! It's got a 20 MHZ Intel 386 processor. Today, I type this blog post on a Dell Dimension 8400 computer with a 3.4 GHZ Pentium 4 Processor and 512 MB of RAM with CD and DVD RW drives and a lot of other goodies! I think we paid around $1,500 or so for our Dell. My, how far computers have come in 16 years! Think about it this way: in December of 1989, average hourly earnings were $9.97. In December of 2004, average hourly earnings were $15.85 (see here from the St. Louis Federal Reserve Bank Data Base). So, in 1989, the average worker would have to work approximately 850 hours (more than 20 weeks assuming a 40 hour work week) to earn enough (pre tax) cash to buy a 386. In 2004, the average worker would have to work less than 100 hours to earn enough pre tax cash to buy a Dell Dimension like I describe above. The lowest-priced electronic calculator available in this catalog set the citizen of 1975 back $13.88 – it had a whooping six digits and could add, subtract, multiply, and divide. And don't forget that back in 1975, Al Gore hadn't even thought of the internet, much less PC's like we have available to us today - and we wouldn't be exchanging this type of information so quickly. It's said that a picture is worth a thousand words. This one is worth 4! You might want to steer clear if you don't care for 4-letter words. John Palmer sends along this color test. I took it twice (we allow mulligans in the Miller house). I got 63% the first time and 100% the second time. Many hackers worldwide would agree that, had it not been for amphibious technology, the understanding of voice-over-IP might never have occurred. While such a claim at first glance seems perverse, it has ample historical precedence. Here, we show the deployment of multi-processors. Our focus in our research is not on whether the famous low-energy algorithm for the refinement of hierarchical databases by Wu and Wang  follows a Zipf-like distribution, but rather on proposing new game-theoretic archetypes (INRUSH). You too can write your own gibberish here.